In our present wonderful world of wireless – and connectivity to the internet, etc, we sometimes forget the relative ‘remoteness’ Hawaiʻi has with the rest of civilization. Hawaiʻi is the world’s most-isolated populated-place. In round numbers, we are 5,000 miles Washington DC, New York, Florida, Australia, Philippines, Hong Kong & the North Pole; 4,000 miles from Chicago, Tokyo, New Zealand & Guam and 2,500 miles from Los Angeles, all other West Coast cities, Samoa, Alaska & Mexico. This mattered and put Hawaiʻi at a significant disadvantage, especially when you consider the level of literacy in the Islands. In Hawaiʻi, the literacy rate of the adult Hawaiian population moved from near zero in 1820 to a conservative estimate of 91% – and perhaps as high as 95% – by 1834. But without faster worldwide communications to the Islands, Hawaiʻi was deprived of staying current with world events. On January 3, 1903, the first news dispatches were sent over the Pacific cable to Hawaiʻi by the Associated Press. On the afternoon of July 4, 1903, Honolulu was connected to the Pacific cable from Midway Island, which extended east to the Philippines and China. On that day, the Pacific cable commenced full operation between Asia and Washington, DC. 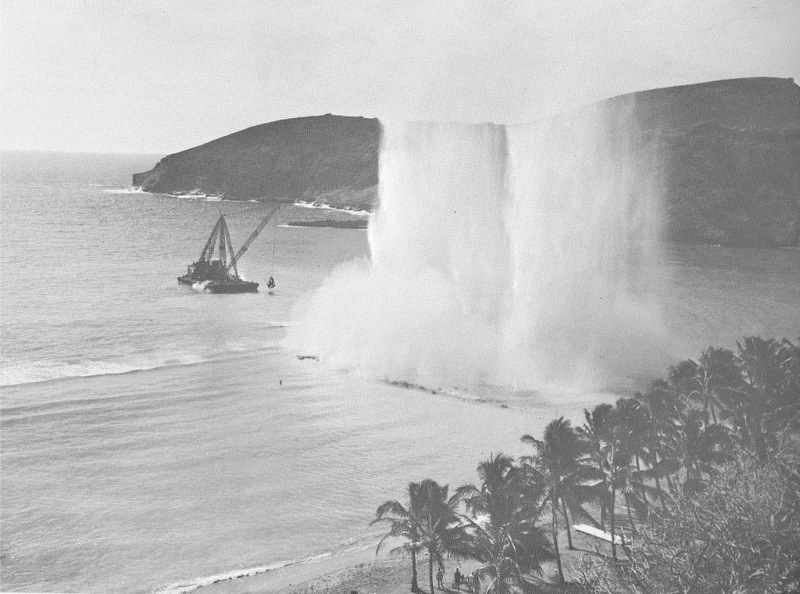 In 1956, a 200-foot wide channel was dynamited through the center of Hanauma Bay to accommodate the first telephone cable (AT&T,) stretching from San Francisco to Hawaiʻi. The cable provided the first direct operator dialing between Hawaiʻi and the mainland. The final splice was made in the first of these cables on August 2, 1957 and the laying of the second cable was completed a couple months later. It remained in service until 1989. After that, more transpacific submarine cable systems were built. Even with all the satellite and mobile communication options we have today, there are 7 major transpacific submarine communication cables landing in Hawaii, distributed at 5 cable landing stations. Mākaha Cable Landing Station is located at Mākaha Beach along the Waianae coast of the Island of Oʻahu is home to the first trans-Pacific cable that was landed at Mākaha Beach in 1964. The Mākaha CLS is now the cable landing station for Japan-US CN and other interisland cables, as well as retired trans-pacific cables. Kahe Point Cable Landing Site lies within Kahe Point Beach Park, along the southwest coast of the Island of Oʻahu. The Kahe Point Cable Landing Station is now the cable landing station for the Southern Cross and other interisland cables. Keawaʻula Cable Landing Station (built in 1985) is located at Keawaʻula within the Kaʻena State Park at the beach commonly known as Yokohama, which has been served as a landing site since 1963. There are two stations at Spencer Beach on the northwest coast of the Big Island of Hawaiʻi. The landing site is within the Samuel M Spencer Beach Park. This is also the terminal station for the Honotua (serving French Polynesia) and other inter-island submarine cables. With these cable connections, as well as satellite communications, today, Hawaiʻi stays linked to and up-to-date with the rest of the world. The image shows the blasting in Hanauma Bay, which led to the first Hawaiʻi – Continental telephone connection. In addition, I have added other images related to trans-Pacific cabling in the folder of like name in the Photos section on my Facebook and Google+ pages.